Copyright -- our system for protecting and encouraging creativity -- has been described as "the engine of free expression." But copyright can also interfere with free speech -- with the public's right to share, enjoy, criticize, parody, and build on the works of others. Resolving these sometimes conflicting claims requires policymakers, in the words of the Supreme Court, to strike a "difficult balance" between rewarding creativity through the copyright system and "society's competing interest in the free flow of ideas, information, and commerce." Where should we draw the line between rewarding creativity through the copyright system and society's competing interest in the free flow of ideas? These questions have become the subject of heated debate in Congress, academia, and the arts and entertainment industries. 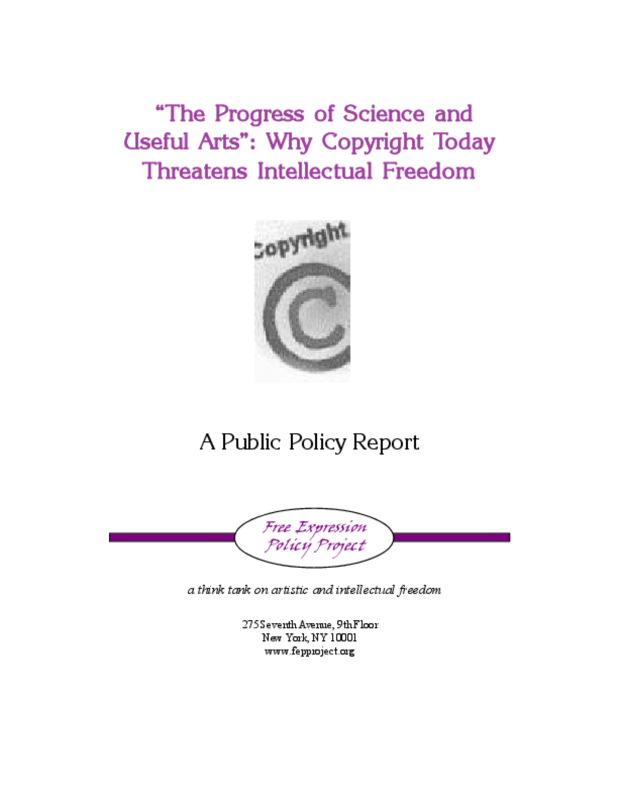 "The Progress of Science and Useful Arts": Why Copyright Today Threatens Intellectual Freedom demystifies such complex laws as the 1998 Sonny Bono Copyright Term Extension Act and Digital Millennium Copyright Act, and deconstructs the underlying conflicts over "fair use," parody, copying, and the public domain. The report concludes with eight recommendations for a better-balanced public policy on copyright and free expression.